My sister-in-law is dermatologist and I come from a family of doctors. They’ve taught me to always take great care of my skin; and to never leave the house without sunscreen on my face and entire body. Sunscreen is one of the most important things you can use to keep your skin healthy and prevent premature aging. From an early age my mom always put sunscreen on me; and I do the same with my boys. I love sunshine and the summer months. The boys and I play outside any chance we get. I make sure we are slathered in sunscreen. We keep some at their changing table and put it on first thing in the morning. I keep some in the diaper bag; and I keep some in the stroller. Since we spend a lot of time outside it is very important that myself and the boys are protected. I just started using Babo Botanicals sunscreen, it’s naturally sensitive for babies and adults. Babo believes that family comes first; and they make products that everyone can use together. Babo sources ingredients from nature and gets that our skin is our largest organ, what we put in to it and on it matters. Babo uses only pure and natural ingredients. In my beauty routine I like to use a tinted moisturizer with SPF so that I am covered all day long even in the winter months. I love that Babo makes one that goes on smoothly, is all natural, and protects my face all year round. I also love the tinted lip glosses, many people don’t realize how important it is to protect their lips as well. 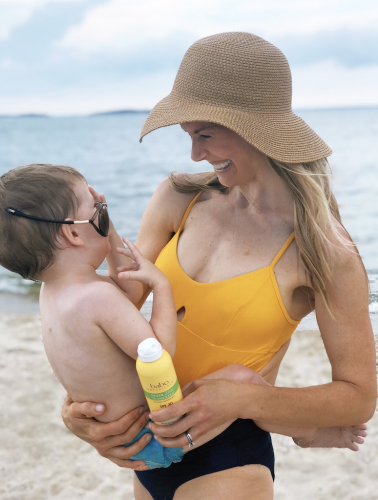 The Sun Care from Babo Botanicals 100% Zinc Sheer Continuous Spray SPF 30 sunscreen for the entire family saves me from tantrums and lets the boys walk around while they are being sprayed. Babo’s fragrance free sunscreen is perfect for extra sensitive skin, protecting your family against damaging UVA and UVB rays. While providing 80 minutes of water and sweat resistance. It’s great to pull out the bottle of sunscreen and know that I can spray the boys and myself in one fell swoop and not have to individually rub the lotion in. We almost make it a game and I let the boys spray me as well. I want them to learn from a young age that protecting yourself from the sun is so important. The Sun Care collection products are lightweight and ultra-sheer so the boys don’t even think I am spraying anything on them. I love that are lightweight, some sunscreens just feel so heavy when you are spraying them. They are also fragrance free and hypoallergenic. The best thing though is that they are water resistant, I can spray the boys and then a few minutes later they can get wet! The Sun Care collection leaves us sun burn free. We typically go to the beach for 3-4 hours at a time. I reapply 1-2 times depending on how much water we have all been in and have yet to get a burn! Some of my favorite products from the Sun Care collection are the spray Sheer Zinc Continuous Spray Sunscreen SPF 30 and Clear Zinc Sunscreen Lotion SPF 30. They also have many other products like a tinted moisturizer with SPF which I like to wear everyday, and After sun aloe gel, just to name a few. Keep yourself and your kids protected this summer with Babo Botanical Sun Care Collection. Use code KMLUV30 for 30% off until October 31st. Kate Solomon is the founder of Babo Botanicals. Her father was a beekeeper and shared his skill and love for bees with Kate early on. Her passion for beekeeping and sustainable agriculture strengthened as she got older. After graduating from Harvard she joined the peace corps and shared her knowledge of beekeeping with women in rural Paraguay so that they could support their families. She taught the ladies how to harvest as well as taught them about the nutrition value. When Kate came back to the US she was a hair and skincare product developer for brands including L’Oreal, LVMH, Avon, and Redken. 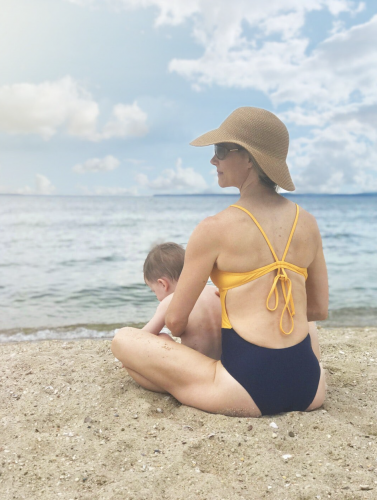 When she got pregnant with her first kid she searched for a line of products that felt safe and natural enough for her and her newborn. She found that most baby and children’s products did not address particular hair and skin problems like adult products did. She decided to create her own line formulated with very clean, natural ingredients for adults and children and Babo Botanicals was born. Fun fact that Babo is named after her son’s security bunny. Kate’s mission is to provide the highest quality, purest family hair and skincare products, and Babo is entering its 8th year of fulfilling that mission. I feel safe using Babo Botanical products on the boys and myself! Next thing I want to try is their hair collection! Tell me what is your favorite sunscreen in the comments below.